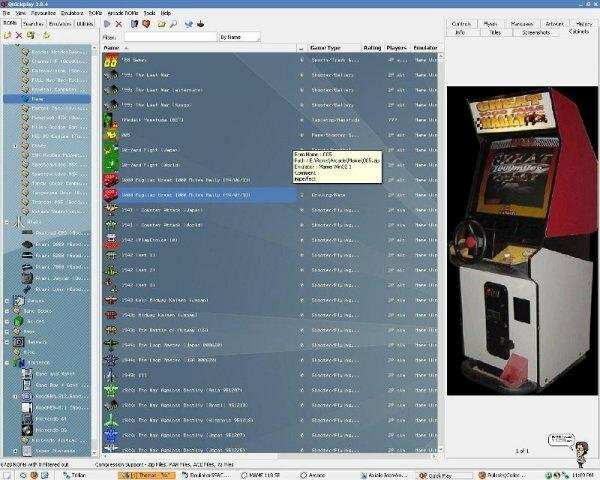 QuickPlay is a windows-only powerful universal emulator 'frontend-of-frontends', which has support for countless emulators and systems, old and new, with a philosophy of being quick and easy for new users, yet comprehensive and flexible for old-timers. It was written in the heyday of RAD and OO frontends (as such it's written in Delphi), and like other frontends of the time, its very powerful and able to support considerable complexity and customisation (think MAMEUI, but on steroids). However unlike many other frontends of the time, its also very flexible and adaptable, and still updated by enthusiastic supporters. It takes a fresh approach to the backend which, in particular, gives blisteringly-fast search over large and diverse romsets. Support for GoodMerge ROMsets, configure QuickPlay to automatically launch the ROM of your choice from a GoodMerge ROM, or "look inside" a compressed file to run whatever game you want. 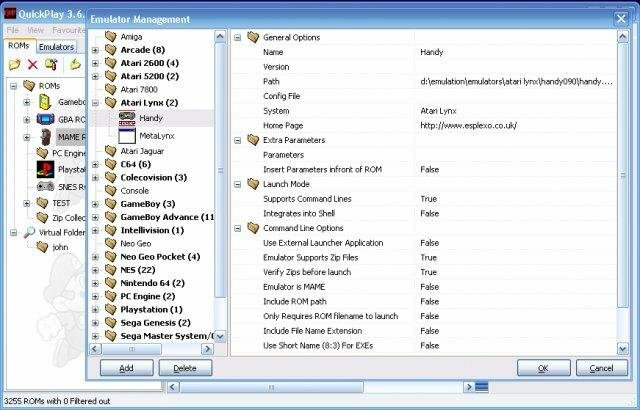 Emu-Finder - an automatic way to find all supported emulators on your computer and add them to the emulator database - can save LOTS of manual work! This feature is also infinitely expandable with new Dat files which add to its capability. The DAT files have been updated, and now include nearly all the emulators on Zophars Domain. Play IPS hacks of games. Thanks to DAN for the code. Backup tool, once you have QuickPlay set up how you like it, backup your configuration files and then if you make a fatal mistake later you can restore from the backups! Virtual Folder support, you can do a search on all your ROMs and save the results as a Virtual Folder, to keep that search for all time. The Virtual Folder is always up to date with any new ROMs you add. Drag and Drop support. Now you can drag your ROMs from one folder to another so you can sort your ROMs into genres, or just your favourites! Also you can drop files from Windows Explorer into QuickPlay and they will be added to your ROM lists! Virtual Tree view means that your ROM lists will always load super quick, even if you have thousands of ROMs! 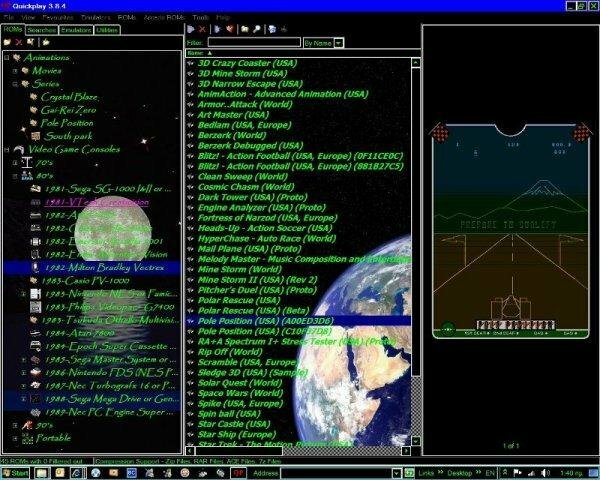 Media Panel is capable of displaying ROM related images, and can launch other media such as FAQs and videos in the system default player. Dodgy support for running QuickPlay from Read-Only media. Directory Mirroring, set up a folder in Quickplay to mirror a directory on your hard drive, and with one click of a button Quickplay will ensure its data reflects the status of the folder! Ideal for people who regularly download new ROMS. Multi-directory Scanner, for scanning a large amount of directories for ROMs, from one handy dialog. Folder based database for storing ROMs - you add them once and they stay there, so you don't have to repeatedly scan ROMs. Favourite ROMs - you can add your favourite ROMs into a favourites list which is easily accessible from the main menu, no need to go looking for that game you always play! Find ROM - when you need to find a certain ROM, but cant remember where it is - simply use the search and enter the first few characters of the ROM name and hit search! Output to XHTML/XML/Text - you can now output your ROM listings into an XHTML file for showing off to your friends! 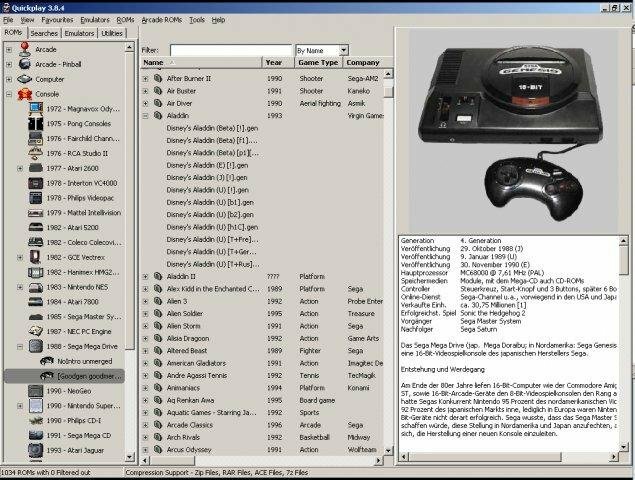 There are various output options, one of the most useful is the option to output any MAME games that are not on your system. 1,157 5,019 QuickPlay <img src="https://www.oldergeeks.com/downloads/gallery/thumbs/QuickPlay1_th.png"border="0"> Feb 01, 2019 - 12:45 4.6.5 32.71MB ZIP , out of 25 Votes.